Sunday 21st September 2014 – 7.30am – Claire Brown. 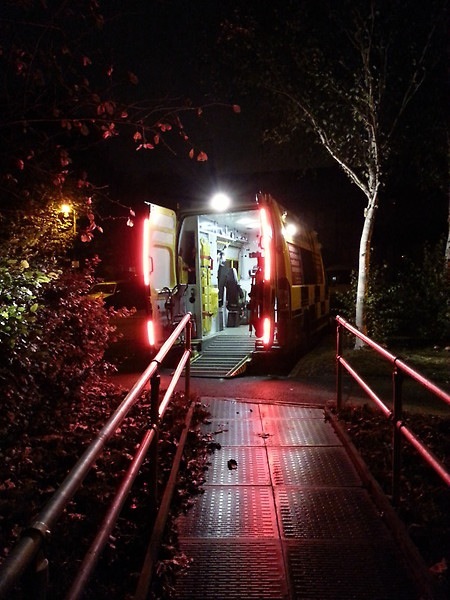 Ambulance staff and medics were on scene providing emergency trauma care to a woman who ended up trapped in the wreckage of her car for over an hour in the early hours of this morning in Oldbury. West Midlands Ambulance Service was called to a two car road traffic collision on the junction of the A4123 and Titford Road, Oldbury, Birmingham just before 1.00am this morning (Sunday). Five ambulances, a paramedic area support officer, the Hazardous Area Response Team (HART), medics from the West Midlands Central Accident Resuscitation Emergency (CARE) Team and two further doctors on the MERIT trauma car attended the scene. A West Midlands Ambulance Service spokeswoman said: “Two cars had been involved in a significant collision; the engine of one of the cars had ended up 50 metres away. “The driver of this car, a 27-year-old woman, was knocked out and had sustained a serious head injury and fractures to her leg and pelvis. Medics administered advanced analgesia to help manage her pain whilst the fire service worked to extricate her. “After just over 60 minutes, the woman was released from the badly damaged car and ambulance staff immobilised her onto a neck collar, scoop stretcher and pelvic splint before being alerted to Queen Elizabeth Hospital Birmingham for further emergency trauma care. “The four occupants of the second car, four men, had self-extricated from the vehicle which had caught fire prior to emergency services arrival. Thanks for the update Claire. All of our information is based on what the crews tell us so sorry for the confusion. Please pass on our thanks to your sons who it sounds like did a brilliant job.